One thing that I find true in nearly all FPS games is that my adrenaline is always in a heightened state. These are not games meant for relaxation. They are not games you play to unwind before turning in for the night and they are not games you play if you’re already salty. They are tough. You will fail over and over again and that will just make a bad mood worse. This is where an FPS like Masked Forces from Freeze Nova comes into play. There are many FPS (first-person shooter) games on the market these days. They’ve been around for many years but really took a toe-hold when the original Wolfenstein 3-D hit the scene in 1992. The gaming scene was forever changed when players were not only placed in the first-person perspective but able to experience the world of Wolfenstein in a 3-D format. Wolfenstein 3-D was based on the brand new gaming engine Catacomb 3-D that was released the year before by id Software, the makers of Wolfenstein 3-D. From that point onward there have been many FPS games and they, of course, varied greatly from bad to ok to excellent. I’m a latecomer to the FPS scene. For reasons unknown to myself I always avoided them. Seeking instead to play more story-centric RPG games, simple arcade style games (of which Bomberman for the NES and Dr. Mario remain my all-time favorites), or fighting games like Mortal Kombat. I have and will always be a fan of the Diablo series from Blizzard Games and still play it to this day. Which brings us to how I discovered I was missing out by not playing FPS games. When Overwatch was released I was in the beta and fell completely in love. I now have well over 300 levels into Overwatch despite not playing more than a few hours the past 6 months due to schedule constraints. From Overwatch, I moved to PlayerUnknown’s Battlegrounds (PUBG) and Fortnite Battle Royale. And now I’m an FPS fan, newly minted and eager to try all the things. I picked up Counterstrike: Global Offensive (CSGO) on a recommendation. I use it work on my shooting and aiming skills for PUBG. Though I don’t get into random online groups in it due to the toxicity that runs rampant in CSGO I really enjoy playing the offline modes for practice and will on occasion play online in teams with friends. Masked Forces is a very refreshing way to get my FPS fix without the stress. 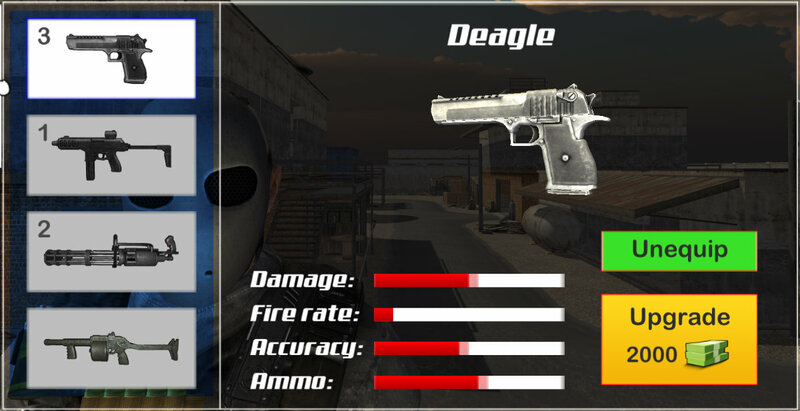 I’ve taken to calling it “FPS-lite” because of the slimmed-down controls, customizations, and short rounds. When you first log into the game it will ask you for your resolution and graphics level as well as if you want windowed mode or not. Once you’re in the game you can fine tune that a bit by choosing between low-, medium-, or high-quality levels. You can change languages as English, Russian, and German are supported at this time. The key option, though is the ability to tweak your mouse sensitivity. As with all FPS games you’ll need to try a few different settings on this to get it where you need it to be for your gameplay style. Once your settings are ready, you’ll want to hop into the Campaign mode first. This mode sets you up with quests to complete in the offline mode so that you can earn money to upgrade your weapons and armor and later to buy new items as you level up. They never seem to dry up, or at least they haven’t for me and I’m about halfway through level 6 now. The harder the quest the more money it is worth. There are quests to kill a certain number of enemies before the round is up, to survive a certain amount of time, or you are challenged to win a Death Match. These quest goals get harder with each one you complete. Once you’ve geared up a bit and have a few levels under your belt you can join an online game. This is where I find my first real complaint with the game. Despite my best efforts, I could not get a free-for-all game room set up and each time I attempt to join a game it is on the DOOM setting. Though fun now and then this is not the only type of online experience I would like. In this setting, everyone has an RPG launcher and you simply run around trying to blow everyone up before they blow you up. Again, fun, but I’d like to play some online Death Matches as well. The gun types are limited and it takes a lot of leveling up of your character to gain new ones but the ability to upgrade your weapons is nice. It helps fill in the gap between weapon purchases by getting a slightly better version of the guns you already have. Armor cannot be upgraded and is much more expensive. Plan accordingly if you are going to want to purchase a new set anytime soon. I’m sure the limited customization and leaner list of weapons to choose from will be a turn off for some, but in a game this light I thought it was perfect. I don’t want to spend hours customizing to jump into a few matches and pop some people off. Overall, the game is a fun, fast-paced FPS-lite that lets you experience the mechanics of the FPS style without the adrenaline-inducing panic that often comes with many of the larger and more robust games in the genre. The surroundings are simple with not much detail in the environment but enough that you can easily tell what the object is. I think this lends well to the game, though. You won’t be in that game long due to the fast round times. I’ve had absolutely no connection issues even in the online mode. I also haven’t experienced any lag which I so often do in other online games. The game was released in November 2016 and has some DLC and there is even a version 2. For the current price as of this review of $.59USD (yes, that is 59 cents in USD) on Steam you will more than get your money’s worth if you pick up this title.